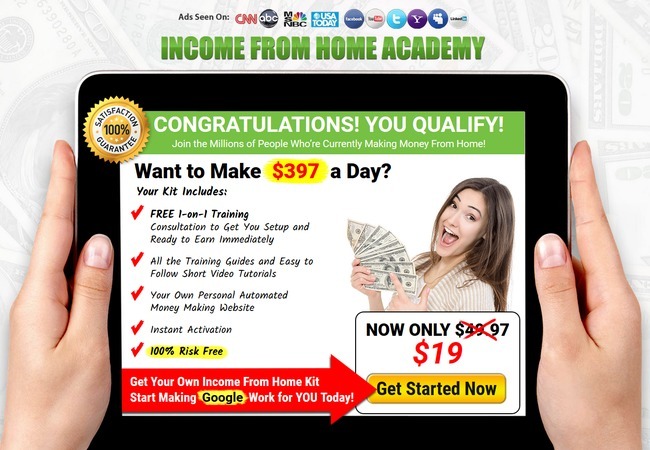 Income From Home Academy Scam Review - Stay Away! Income From Home Academy has been around for quite some time, but still there are people falling for the scam from time to time. So I have decided to write a comprehensive review to warn my readers about the scam. If you are still considering to pay for it, make sure you read the full Income From Home Academy review before giving yourself a financial headache! 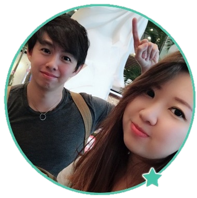 To many inexperienced internet users, this make-money-online kit may seem like a godsend opportunity to finally start earning from the internet. However, for someone who has been scammed multiple times and making an actual monthly income from the internet, the sales pitch seems all too familiar to me. There are multiple similar scams out there, such as Ultimate Home Profits and Learn How to Academy (I believe it’s related to Income From Home Academy) which I have reviewed before. The typical promises of “ready to earn immediately”, “automated money making machine” and “100% risk free” are all present within the sales material of Income From Home Academy. Before I found the real way of making money online, I was a frequent customer of these scams because I have always wanted to make money from home. Don’t be like me. 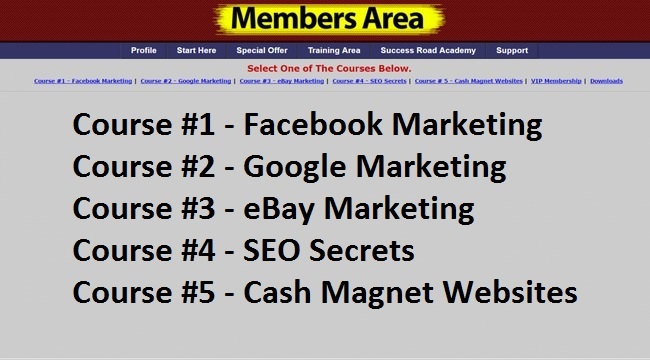 I’ll show you what’s inside the paid membership area, but before that, let’s talk about the common red flags that you can see within the sales pages of Income From Home Academy scam. It’s doesn’t hurt to learn spotting one or two red flags so you can protect yourself from other scams in the future. After reading through the entire sales page of Income From Home Academy, do you really know what the kit is all about? If you think about it, all you have seen are some unverifiable checks and money accounts, a description of what the opportunity is NOT about (see screenshot above), and that you can start earning with a small fee. Nobody knows what they are paying for, because the scammers intentionally keep their victims in the dark. So when you come across an online opportunity, a good question to ask before you get started is – what am I paying for? If you can’t answer this question, don’t pay for it. You Can’t Even Trust the Testimonials! Testimonials and reviews are powerful because they represent social approval from the satisfied customers who have benefited from a product. There are a few testimonials shown within the sales page of the scam, and I just want to point out that these are fake testimonials. You would’ve probably guessed it from the model-like profile pictures, but here’s the actual evidence. A simple image search via Google revealed the origin of these pictures. Compare the stock photos above against the VIP members of the scam. If you don’t know what stock photos are, they are basically royalty-free images that anyone can buy and use for their advertisements. Have you come across beauty salon advertisements with pictures of young ladies in a spa session? Or pictures of cheerful teenagers in a college advertisement? Those are stock photos that can be bought online. These aren’t necessarily their real customers or students, and they don’t need to be. They are just used to portray the service provided. On the other hand, Income From Home Academy scam used stock photos to fabricate fake testimonials and to deceive its victims, which is totally unacceptable. There’s a countdown timer at the checkout page, and you have only 5 minutes to complete payment before your “95% discount” will expire. Just so you know, the countdown timer is fake. You can wait for it to expire, and your discount will still be valid. It’s just there to make you think you have to make your payment quickly. But why the rush? Can’t they give you enough time to type your credit card details? Enroll today and your card will be charged $19 (no surprise here). Suddenly, a $19 kit becomes a highly expensive monthly recurring plan. Not what you were expecting, eh? Alright, here’s what most people want to know about. When you finally get into the members area, you’ll be presented with a video that promises you’ll make big profits soon enough. It directs you to the “training area”, where the bulk of the courses are. At the same time, you are repeatedly urged to upgrade to VIP membership for $47, but there’s no mention of what being a VIP does for you. Anyway, I headed straight to training area, and there are 5 video courses available. I know a lot of you may have difficulty reading the small text in the screenshot above, so I’ve included the course titles in the screenshot. Each of these courses last around 20 minutes, and they are all very basic information on these topics. These might have been good for beginners a few years back, but they are so horribly outdated that they will probably do more harm than good for you. 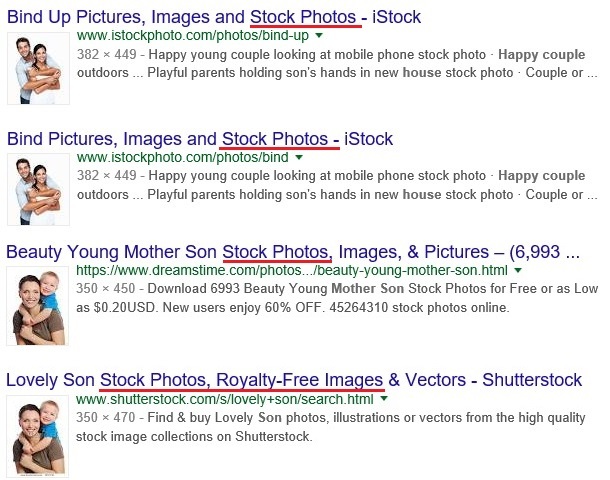 For example, in course #4 SEO Secrets, you are taught to stuff keywords in your website for better ranking. As a guy who makes money online via money websites, following this advice alone would have made Google slap a huge penalty on your website ranking. If you want to know the proper process to build a website that generates income, I’ve written the Ultimate Guide to Build a Money Website and continually update it. In this guide you’ll learn the real way to start making money online, and it isn’t as simple as the scammers want you to believe. Get ready to do some work. So, what’s next after finishing the basic courses? Think you are ready to make $397 a day after finishing the 5 basic courses? Nope! 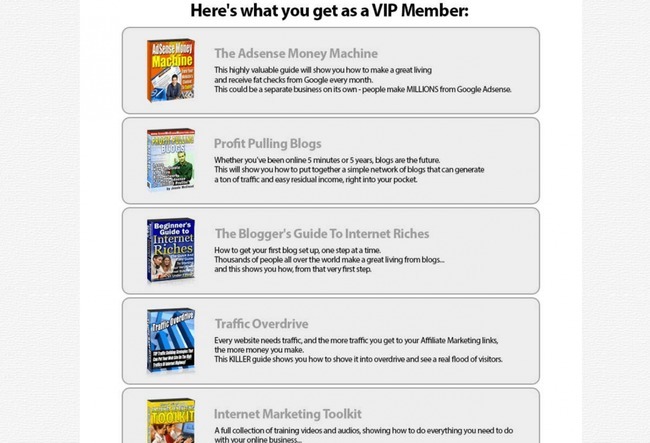 Once you are done with all those, you will be required to become a VIP member to “really start making money online”. There are a lot more courses to buy as a VIP member (as shown in screenshot above), which binds you in a situation where “one scam leads to another”. You won’t get anywhere with Income From Home Academy kit. Should I Buy Income From Home Academy?